Organisers Tony and Ruth Knowles, pictured with the performers at last year's event. 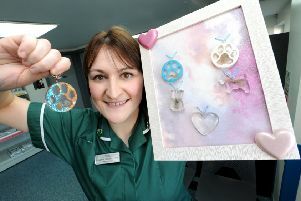 The Emma-Jayne Memorial Fund is hosting a charity evening to raise funds for the Neurosurgical Unit at Hull Royal Infirmary. This year’s annual charity event will take place, once again at Sutton Social Club on Saturday, April 22. Doors open at 6.30pm, with the event kicking off from 8pm-1am. The evening will feature performances from Abbie, Liz McKenny, Taylor Soul and Four Shades of Grey. Entry is £4 each and there will also be a large raffle and mini auction. The fund, which has now been running for 18 years this year, was set up by husband and wife duo Tony and Ruth Knowles. They set it up in memory of their daughter Emma-Jayne who died from a brain tumour, just days before her 22nd birthday. Since then the duo have been tirelessly raising money for the hospital unit, Ward 40 at Hull Royal Informary that treated her. For more info, please visit: www.emma-jaynememorialfund.co.uk.